Another new month, another Degustabox! 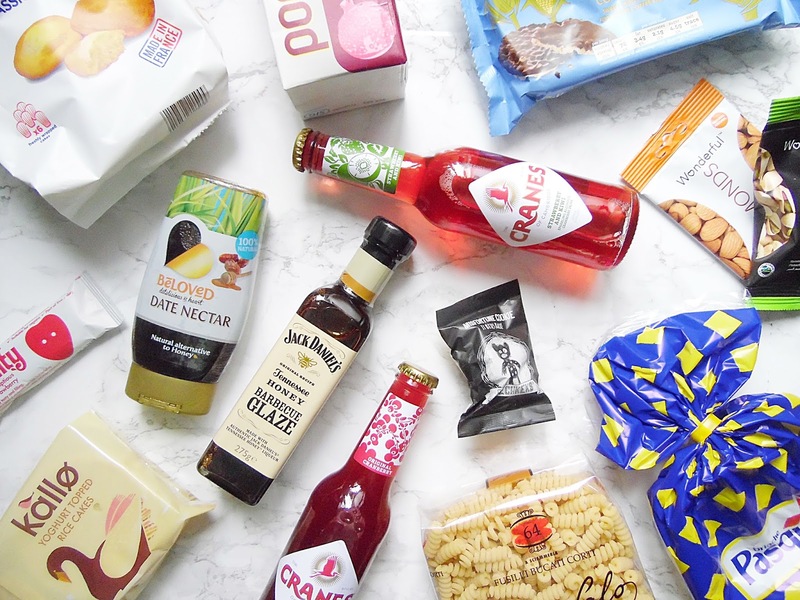 Degustabox is a food subscription box for £12.99 each month you receive a surprise box of food and drink goodies! 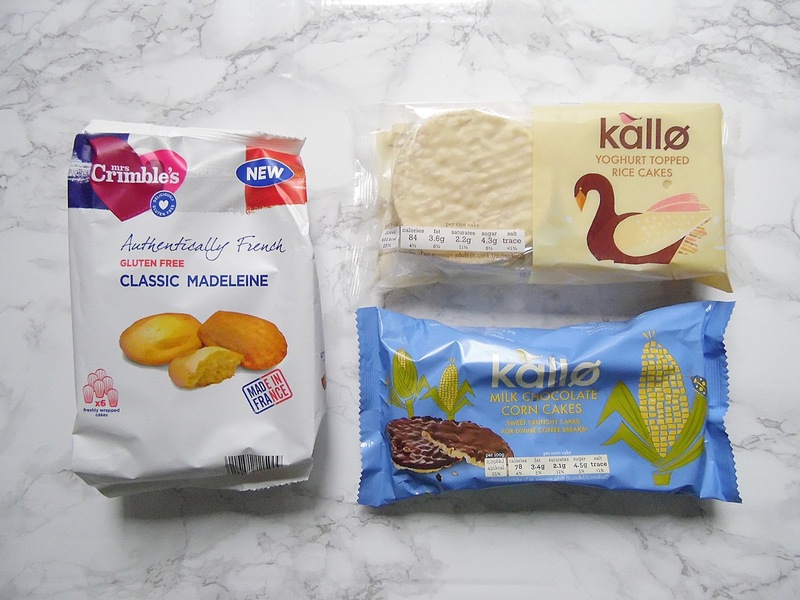 I love getting my Degustaboxes to try out new things I would never try usually, I have found some new favourites through these boxes! In this months box are ten different things to try from pasta to nuts to Pomegrante juice, there is a bit of everything this month! If you have never tried Degustabox there will be a discount code at the end of the box for £6 off your first box. The first item in this months box is the Jack Daniels Tennessee Honey Barbecue Glaze £1.99. This can be used as a dip for vegetables or wedges or as a glaze on meat, I can't wait to use this as a dip as I don't eat much meat. 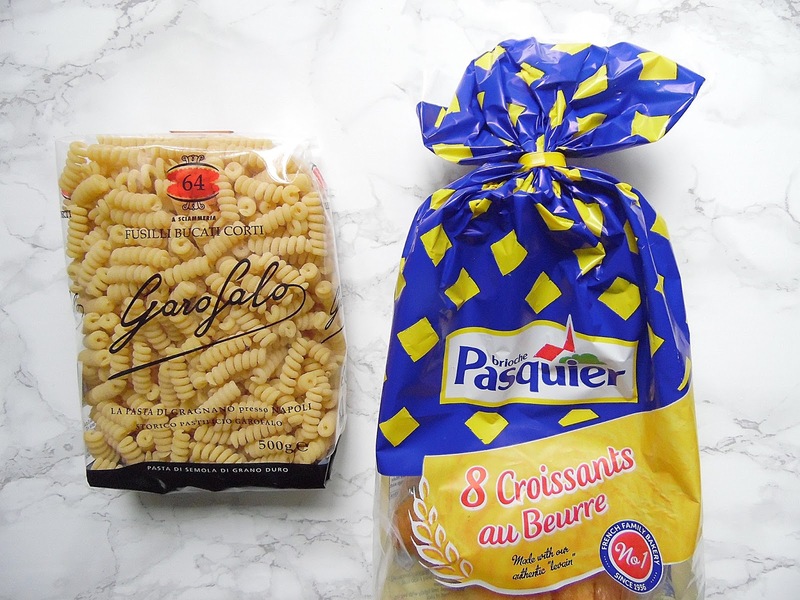 I am obsessed with pasta and the Garofalo Fusilli Bucati Corti £1.99 was delicious. I really liked the corkscrew shape, I usually only like penne but this was a nice change! 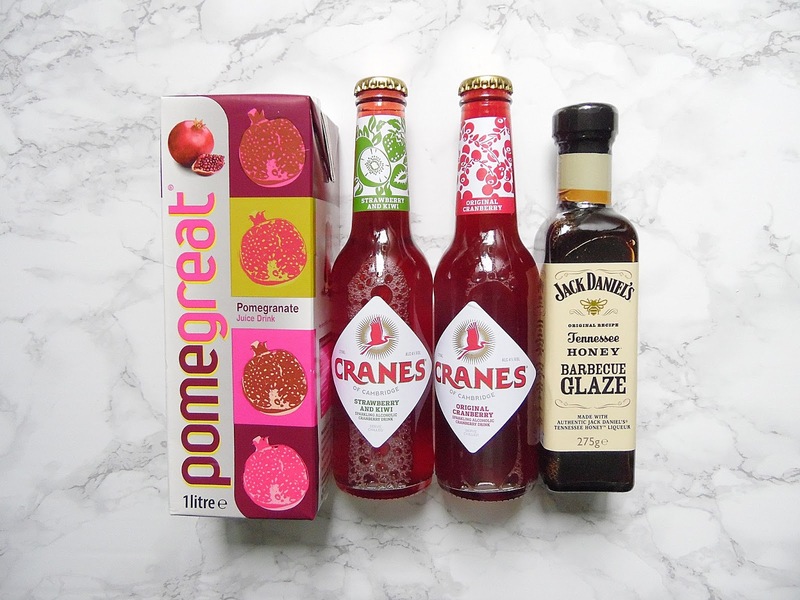 The first drink item in this months box were two of the Cranes 4% Alcoholic Drinks in Cranberry and Strawberry and Kiwi (£1.90 each). I am not usually a fan of alcoholic drinks but these were delicious and I will be getting more for the Summer months! These are low in calories and have little added sugar. Another drink related item in this months box is the Pomegreat Juice £1.49. I didn't think I was going to like this but I loved it as it was so refreshing - perfect for summer! One of the weirder items in this months box is the Beloved Dates Nector £3.50. This is gluten, wheat and dairy free and apparently tastes like sweet caramel but I don't know if I can force myself to try this! 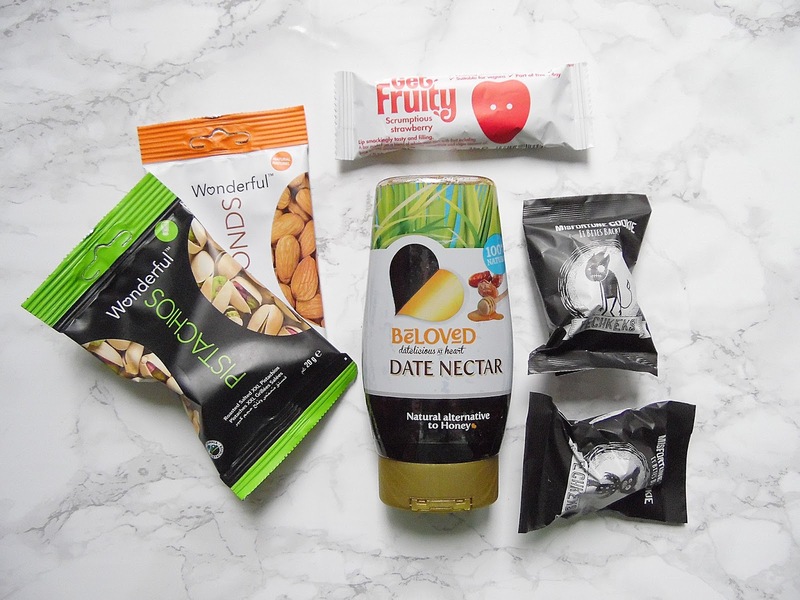 There are a lot of snack items in the box this month and you know how much I love snacks! The first ones are from Kallo £1.29/1.69. In the box are the Belgian Milk Chocolate Corn Cakes and the Yogurt Coated Rice Cakes. I hadn't tried these previously but the milk chocolate ones were the perfect snack for mid morning with a cup of coffee! The Get Fruity Bars £1 are an award winning fruit and oat bar which is gluten free with no added refined sugars. These are available in six different flavours. I kept this in my handbag and thought it was yummy - I want to try some of the other flavours next. There were two packets of The Wonderful Company nuts 90p each. In the box were the Almonds and also the Pistachios, I am not a fan of nuts so I had my Mum taste test these and she said they were the nicest ones she has ever had and as surprised that they weren't extremely expensive. In the box also this month are two of the Pechkeks Fortune Cookies £1 each. The product of the month this month was my favourite thing from the box this month which are the Brioche Pasquier Croissants £1.80. I actually tucked into these as soon as the box arrived and they are already all gone! These are free from preservatives, hydrogenated fats and artificial colours. These can also be enjoyed warm which I am definitely going to try when I buy another packet! You can find out more information about Degustabox and order your box - HERE. This post contains a press sample, all opinions are my own.